Site Navigation: Home Port. The Nelson Touch. West Country Connections. 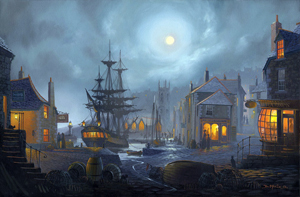 Old Cornish Harbours (moonlight). Fighting Sail. Old Cornish Harbours (evening light). Picture Frames. Donald's Biography. Other Artists & Links. (These prints are no longer available but may be ordered by special request, please contact the gallery). Telephone: 01736 794665. International +44 (0) 1736 794665. All framed print prices can be viewed on the Picture Frames page. 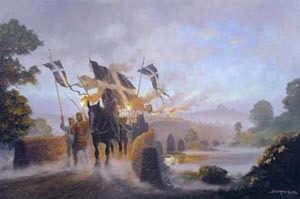 To order a print or to make other enquiries please either email Donald or Telephone the gallery. Although we endeavour to send out your print within 7 days, we apologise if your particular order suffers from some slight delay in delivery. This may be due to a re levelling of stock supplied by our printers. Your order will be fulfilled and we will let you know immediately if there is likely to be a delay with your print. We would like to remind our international customers that Postage and Packing for international orders are subject to different charges. Please contact Donald (bottom of the page) to discuss this. Maritime Art by St Ives Artist Donald MacLeod. Donald works from his studio on the harbourside in St Ives Cornwall. 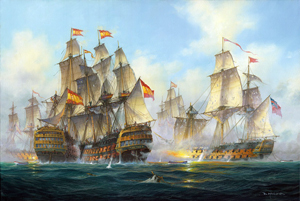 His Fighting Sail pictures depict famous ships and historic naval battles such as Trafalgar and Battle of the Nile. 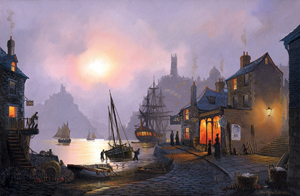 "Donald's' 'Old Harbour' paintings are created from an extensive collection of photographs showing Cornwall in the past. From these he composes paintings that include multiple locations, so that often the images may look familiar but are not, quite. The specific period the paintings are set in is, 'The Olden Days', when all was right with the world, you could get a decent pint of ale for 'tuppence', and hopefully not wake up on one of Her Majesty's ships the next morning." You can also visit the St Ives Gallery which is open throughout the year. Donald will also undertake commissions, if you would like an original painting do get in touch. If you are ordering from outside of the UK: Please email me for a quote on postage and packaging. A new original image added to the Nelson Touch Gallery. 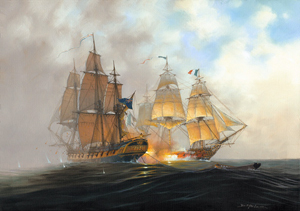 'Engaging the Enemy', HMS Victory at Trafalgar 1805. St. Ives Gallery, The Harbour Craft Market, Wharf Road St Ives Cornwall TR26 1LP. Copyright © Don MacLeod 2014 All Rights Reserved. Images from this site may NOT be copied without prior permission.